This monster muscle car packs even more power than the Hennessey Camaro ZL1 Exorcist. If you’re still craving more power from the 650-hp sixth-gen Chevrolet Camaro ZL1, a tuning house is now offering an upgrade package that nearly doubles the muscle car’s power output to make the Dodge Challenger SRT Demon look tame. Dubbed the VR1100, Vengeance Racing has built a chilling Camaro ZL1 that packs even more power than the Hennessey Exorcist. A video shows the muscle car being rigged up to a dyno, where the results show it generating 1,047-hp and 786 lb-ft of torque at the rear wheels. Taking mechanical drivetrain loss into account, we’re looking at a crank horsepower rating of around 1,200-hp. To achieve this, Vengeance Racing fitted a Procharger F-1A-94 supercharger system, an air-to-water intercooler, Vengeance Racing CNC ported cylinder head, a Stage II camshaft kit, an E85 system, and Kooks stainless steel long tube headers. 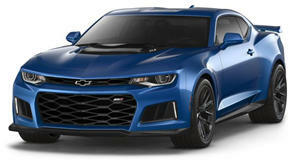 Surprisingly, all that power is handled by the ZL1’s standard LT4 block and 10-speed automatic transmission. You may also need ear plugs after watching the video, as the sound of the VR1100 tearing up the dyno is an absolute aural assault. No price has been released for the insane VR1100, but considering the standard Camaro ZL1 costs $62,000, we expect the tuned version to cost well over $70,000. Sadly, Vengeance Racing hasn’t released any performance figures for the VR1100, but promises to take the monster muscle car to the track soon. A Camaro ZL1 will hit 0-62 mph in 3.5 seconds and tops out at 190 mph, so you can only imagine the potential performance this beast can achieve.